Hello to everybody. I want to share with you some pictures of these Romanian little sweet breads we make for the 9th of March. The dough is brioche like, but maybe sweeter, the same dough we use to make the traditional "cozonaci" (similar to panettones maybe), the ritual sweet breads we make for Christmas and Eastern. Well, these little breads I was telling you about are called "mucenici". They are usually shaped in the form of an "8" or a double spiral, suggesting the human body. There is an Orthodox Christian holiday ocurring at this date - the celebration of the 40 martyrs of Sevastia, who died in the 4th century for their faith. So the shape of the "mucenici" might suggest their sacrifice. Nonetheless more than probable this holday goes back to the Antiquity and is related to the celebration of the New Year (in the old calendar, around this date the spring equinox was taking place), when some rituals had to be made to positively influence the future crops and the well being of the animals. So these breads might have been symbolic sacrificial offerings. 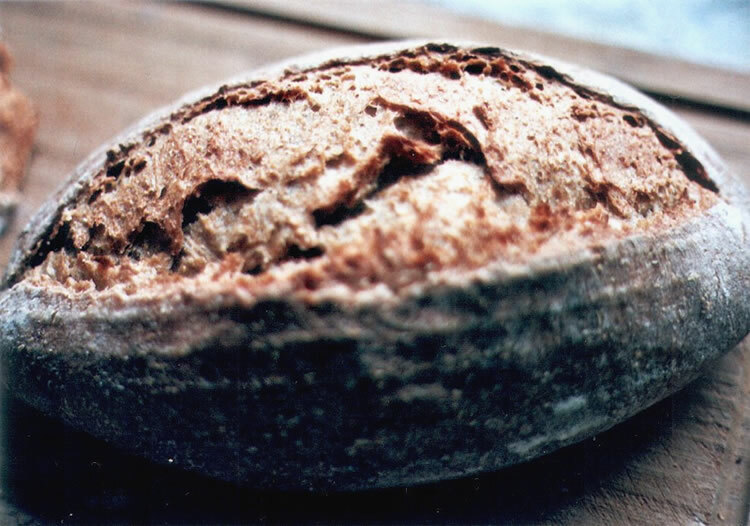 The main reason I am posting today though is to ask you about your experience with sourdough enriched dough. I have no experience whatsoever with it and I would be curious about some aspects, mainly if it is worth the trouble. I wonder if using it would result in better keeping qualities or if the taste is any different. Does sourdough make brioches or panettones better? Read more about Does sourdough make enriched sweet breads better? I have finally managed to translate in English this article I published in my Romanian blog about the history of bread and bakeries. My source was the book ”The History of Food” by Maguellone Toussaint-Samat. 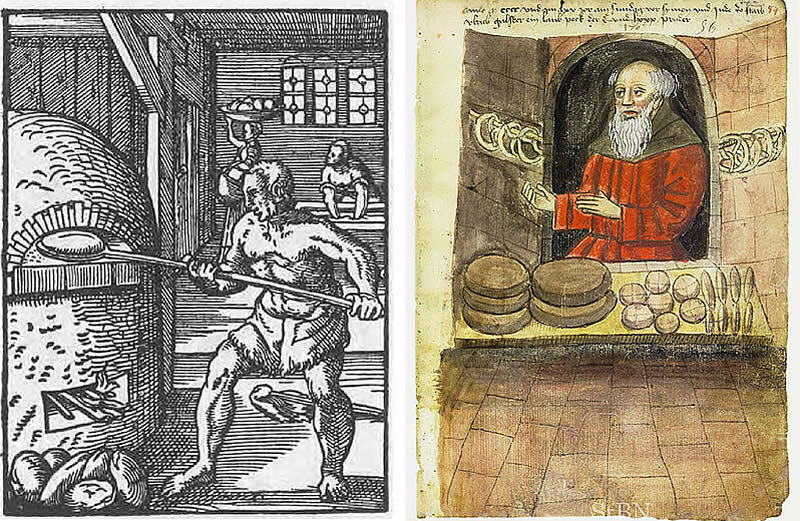 The article is called "Snippets from Books :: The History of Bread :: A Kind of Abstract from ”The History of Food” by Maguellone Toussaint-Samat" and you may press it to read it. All best to you all! Hello everybody! I managed today to post this bilingual article in my Romanian blog. It features one of my favorite breads. I first baked this some months ago, when I discovered the spice "mahlab" in a spice shop and since then I have baked it over and over again. All the people who tasted it got very enthusiastic about it, despite the fact that it didn't taste like "normal bread" (because of it's mahlab scent). Mahlab (mahlep) is a very old spice obtained by grinding the seeds of a kind of cherry tree and it tastes and smells charmingly, somewhat like bitter almonds and cherries. It is used in Greece, in Turkey and in Middle Eastern cuisines to spice breads, pastries and sweets. 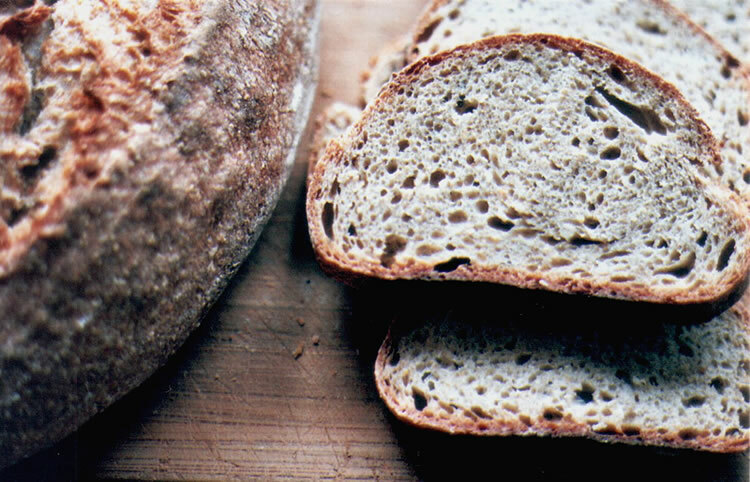 This bread is also interesting because it contains around 20% barley flour and cornmeal and 15% whole wheat flour, which all contribute to its deep taste. It's a sturdy bread, very nourishing, indeed a good old peasant's bread. The basis formula for this bread is taken from Aglaia Kremezi's "The Foods of Greece", a great book, which I highly recommend. I adapted the formula somewhat. Lately I am very passionate about regional breads, the kind of special breads, that are sometimes made only in a very small region of a country, but which have a very long tradition among those people. 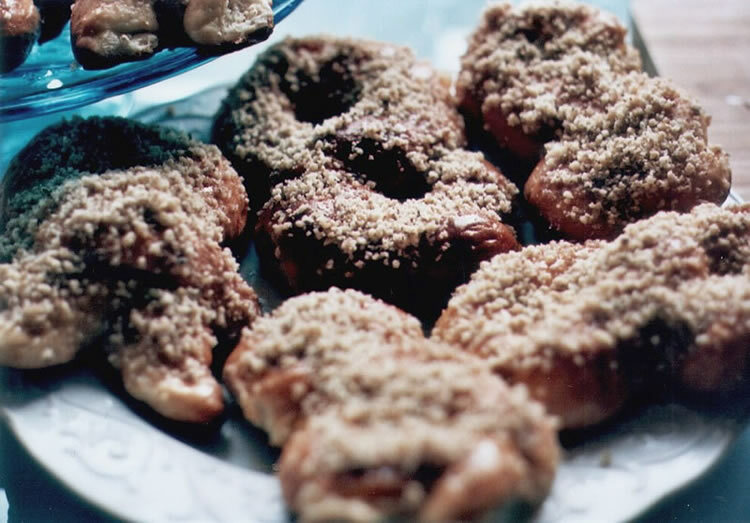 I have found such recipes in some of my cookery books (Aglaia Kremezi, Paula Wolfert) and even if some of the recipes don't include sourdough (but commercial yeast), I am sure they were adapted for the average reader (sometimes this detail is even mentioned). I plan to try more of these breads, with sourdough of course. I will share with you my experiments in the near future. Meanwhile, you can check the formula for this mahlab country bread in my blog article. Happy baking to you all and happy new year! Hi guys! It has been a long time since I've written here. Meanwhile I have started a Romanian cooking blog, where I have began to post stories about some of the breads I am baking. I wanted to show you some pictures of these two breads I made. I will try to share more often also here my experiences with sourdough. So here is the potato bread, a very tasty bread, which filled my whole house with the smell of roasted potatoes. You can check the formula here. The dough was retarded overnight in the fridge. And next you can see my Rugbrød, a delicious wholesome rye bread that I keep baking from time to time. The formula can be seen on my website here or you can check directly Chad's instructions here. Besides that I do have a question to you regarding the stretch and fold technique. Since a while I have given up taking the dough out of the bowl and doing the SF the classical mode. Instead I am just making four or five "stretches and folds in the bowl" (same movements as for kneading, covering a whole turn of the bowl). The smooth part of the dough remains on the bottom on the bowl and I take it into consideration while shaping the breads. I haven't been noticing any difference, but then again I have not been baking so much lately. Do you think it really matters how you make the SFs? 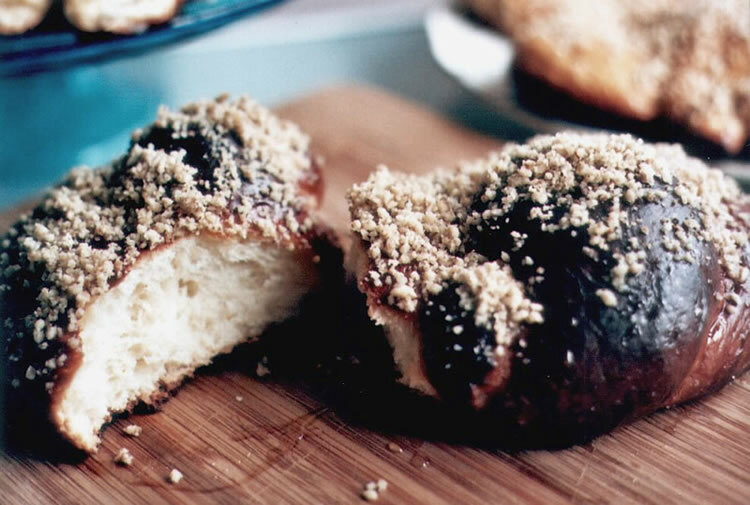 My impression was that what is essential is to somehow break some of the gluten connections, so that the dough creates besides the old ones, new stronger ones. What do you think? I've just baked the sourdough rye with raisins and walnuts from Mr. Hamelman's "Bread" book (pg. 208) and I am very happy with it. I really enjoy its texture given by the combination the nuts and fruits with the very spongy crumb. It is not sour at all and the crust is very "crusty". Also, the rye taste is evident, despite of this being a 50% rye bread and despite the other flavors. A very good, very tasty bread, in my opinion. I halved the quantities and eliminated the yeast from the formula. I used 250 g rye flour No. 1370 (a medium to dark rye flour, 8.3 g proteins) and 250 g wheat flour No. 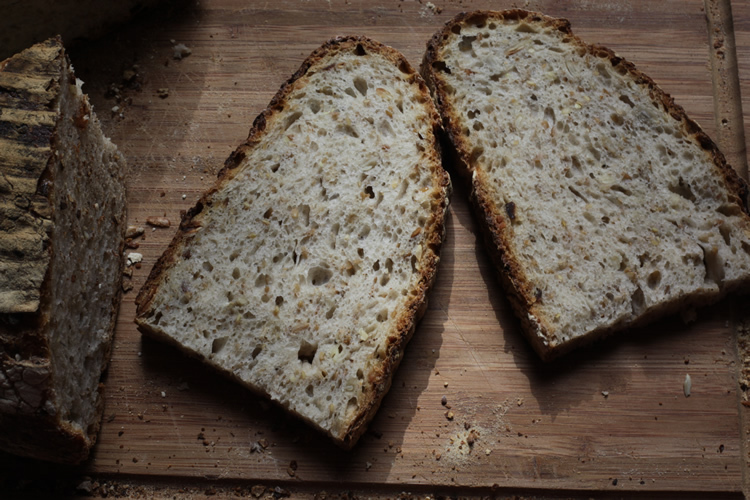 1050 (a dark flour with 11.6 g proteins, the nearest to high-extraction flour that you can find in Germany). For incorporating the raisins and nuts I used Andy's method illustrated here. I also added more water during mixing, around 35 ml, raising the hydration from 68 to 75%. With this bread I also realised I have the worst bread knife ever and that I need a better one very soon. It couldn't deal with the thicker crust of this bread, so the slices were kind of wavy. It also shredded the the crumb here and there, as you can see in the third photo. I wish you all happy baking! Then one year ago, I discovered Peter Reinhart and I started baking breads that require a long time from mixing the preferment and till the actual baking. 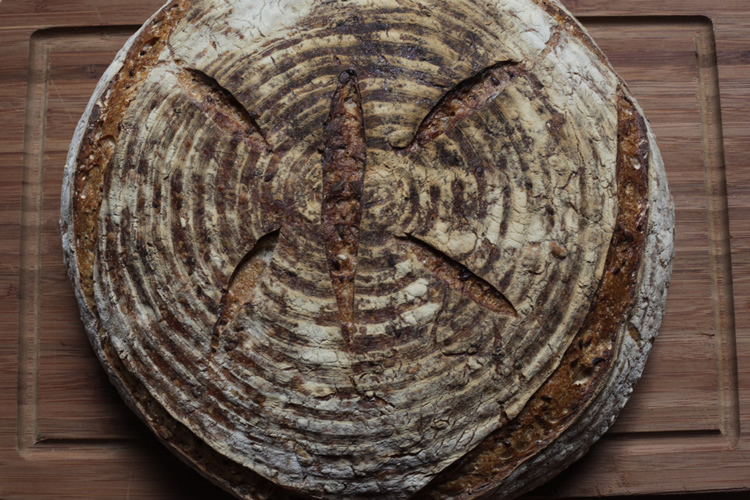 I began finding out about shaping and cold fermentation and I also began working with wetter doughs, sticky doughs, which were so unusual for me at the beginning. Since then I tried more times to grow a sourdough culture, but till this May I didn't manage. Maybe the cold, wet weather in Berlin, where I live at the moment, was a hindrance. This last time, I had also discovered Codruta's Romanian blog, so I decided to follow her (very thorough) explanations for building a culture, and thus I was finally succesful. Yesterday I baked two breads. The first one was an olive levain, using Codruta's recipe, who adapted Pip's one. I didn't change or adapt anything, because I wasn't at all used to making breads which have things (other than seeds) inside, so I didn't know what to expect. I just added dried oregano instead of the mix of dried herbs and I increased the quantity of olives from 250 g to 275 g. The bread came out very good, it's smell while in the oven was absolutely intoxicating and I am pretty sure I am gonna want to make this bread over and over again from now on. I cut each prune in 5-6 smaller pieces, nonetheless I encountered the same problem as Codruta, the fruits were not evenly distributed, there were many slices without any prune at all in them. I think that with this quantity of prunes there is no way that they appear in every slice. I am gonna try next time to increase the quantity of prunes and decrease the hazelnuts one and see if it gets better.